The good news is that gasoline prices are stabilizing. The bad news is that the market can suddenly change. The up and down activity of gasoline prices make it important to get as many miles per gallon (MPG) as possible out of the engine. It may come as a surprise but clean air filters help with fuel efficiency. The air filter is important to the efficiency of the engine because of the need for air. The engine of an automobile requires a flow of fresh air coming into the system. What happens is that the air will mix with the gasoline to create the energy spark that puts the wheels in motion. The right amount of air mixed with the gasoline improves performance considerably. Air filters make certain that the intake of fresh air does not contain any debris. This includes dust, pollutants, and other particles that can cause problems within the engine. Clean air mixes well with the gasoline and generates a higher MPG. As the air filter becomes increasingly more clogged by use, it begins to actually obstruct air going into the engine. To compensate for the decreased amount of air, the engine has to work harder and will consequently expend more gasoline. This results in lower MPG and higher costs at the fuel pump. The economy realized by a clean air filter is reason enough to periodically change it. Replacing the air filter can be part of a routine tune-up although the car owner can do the work alone. However, an air filter is not something to just buy off the shelf. If a car owner wants to make changing the air filter a DIY affair, the first thing to do is to learn more about the engine. The model name and the engine size of the automobile have to be noted. The manufacturer’s part number is needed and a quick look at the owner’s manual will furnish that. With the model name, engine size, and the manufacturer’s part number a car owner can go to an automotive parts center and request the exact filter necessary for the car. The actual replacement requires a few tools like an open-end wrench and a Phillips head screwdriver plus a little bit of time. The car owner should take a look at the condition of the old air filter. It is ordinarily recommended that the air filters be changed at 12,000 to 15,000 mile intervals but driving conditions affect that. Routine travel over dusty roads or in polluted atmosphere may require the air filter be changed more frequently. How the old filter looks will give the owner an idea of how often the filter needs changing. It is possible that a car owner may feel uncomfortable replacing the air filter. This can be especially true if the car is a European model or a high-class luxury vehicle. It might be better to go to the dealership or an automotive repair center to get the air filter replaced. There is a charge for services but professional work reduces the possibility of human error during the installation. The benefits of a clean air filter are almost immediate. Airflow goes back to the proper level to mix with the gasoline. It has been estimated that replacing the dirty air filter will increase MPG on the car up to 10% and also generate a fuel savings of close $.15 per gallon at the fuel pump. Because debris is prevented from getting into the internal engine parts, the life of a car’s motor is extended. 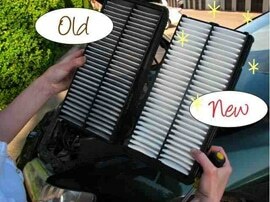 A final benefit is that a good air filter will reduce emissions coming out of the car. That isn’t just a benefit for the car owner; it helps keep the environment cleaner. 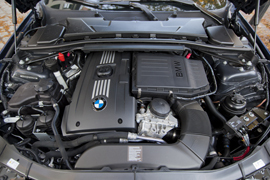 Replacing air filter is not a major overhaul under the hood. It is an excellent means of improving the performance of an automobile and at a price that is well within an individual budget. The cost of gasoline is going to fluctuate and there is no guarantee that it will not suddenly jump. With a little proper maintenance and a good air filter, a car owner can easily handle any increase prices. The fuel savings realized by an efficient airflow system will reduce the overall expense.